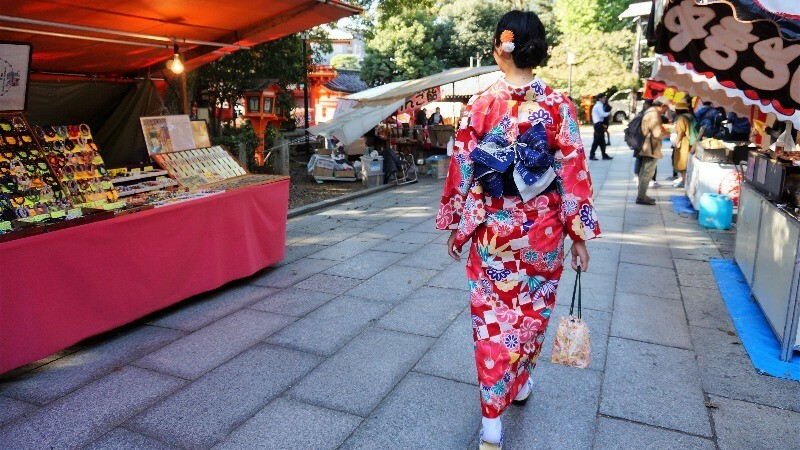 Walk the historic streets of Kyoto in a kimono! Top 5 kimono rental shops! You have to try wearing a kimono when in Kyoto, and I’m going to introduce the 5 rental shops with the best offerings! No matter whether you’re Japanese or not, if you’re a tourist coming to Kyoto, you’re probably thinking of renting a kimono. There are many great places in Kyoto to have photos taken in a kimono, from the historic streets to the countless shrines, and this is one of the reasons for there being so many kimono rental shops in Kyoto. But if it’s your first time renting a kimono, choosing which shop to go to may be difficult. But don’t worry, let me help you! Below you can find information about five great kimono rental shops in Kyoto! I hope you’ll enjoy your kimono-experience! Uruwasiki is a kimono rental shop close to Fushimi Inari Shrine that offers a VIP-experience: they serve a maximum of 20 people a day! 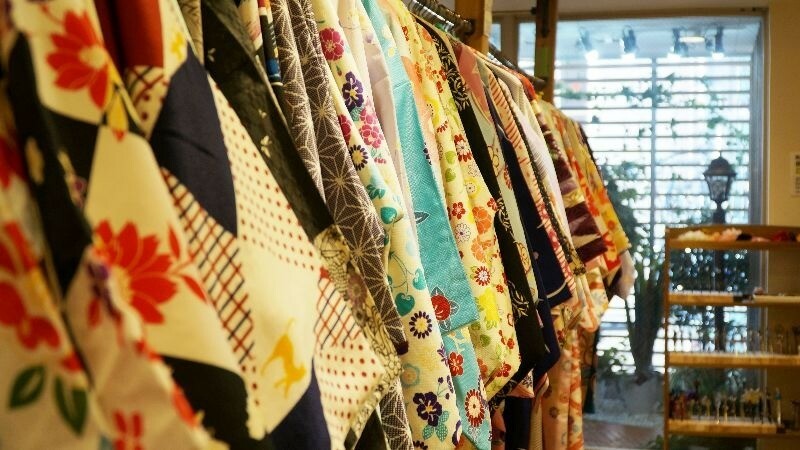 Unlike many other kimono shops aimed at foreigners, here you can also rent more luxurious and formal kimonos too, like homon-gi and furisode kimonos. 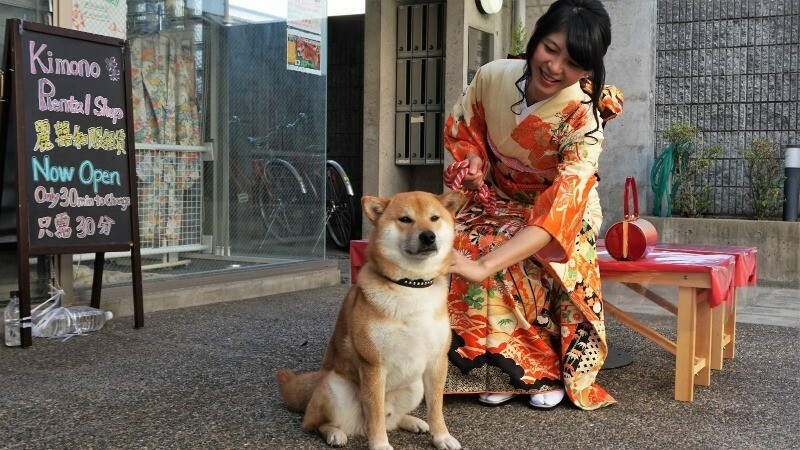 You can also take pictures with the Shiba Inu of the shop, who is the “owner,” and is called Kaji-kun. The staff the shop can speak English, Chinese, French, Spanish, and Korean, so you don’t have to worry about the language barrier here. Good points: Only 20 people a day, so you won’t feel rushed. No worries about the language barrier! 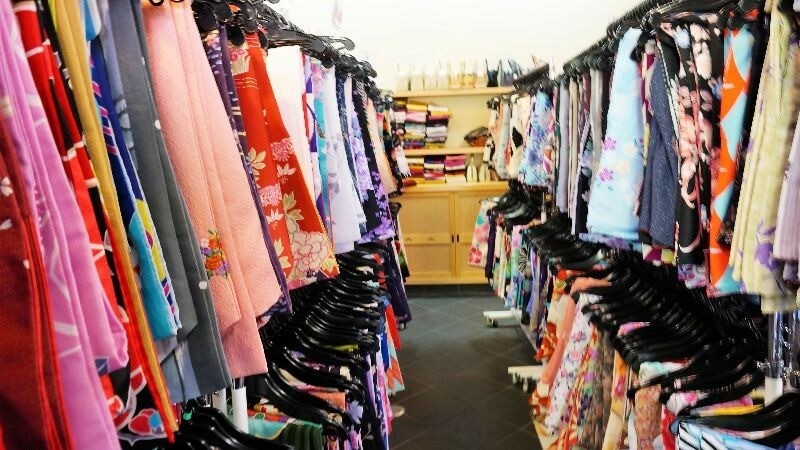 This kimono rental shop is located in the always-popular sightseeing district of Gion, and it’s only a 5-minute walk from Keihan Gion-Shijo Station. Although the shop is not very big, they have a very nice selection of kimonos, from classic to modern, and they also have kimonos for tall and big people. If you don’t know what kind of obi sash to choose, or what kind of hairstyle would suit your kimono, just ask the staff, and they’ll help you choose. The staff is professional, and you’re going to be ready in no time. So let’s go take kimono-pics at the shrines of Gion! 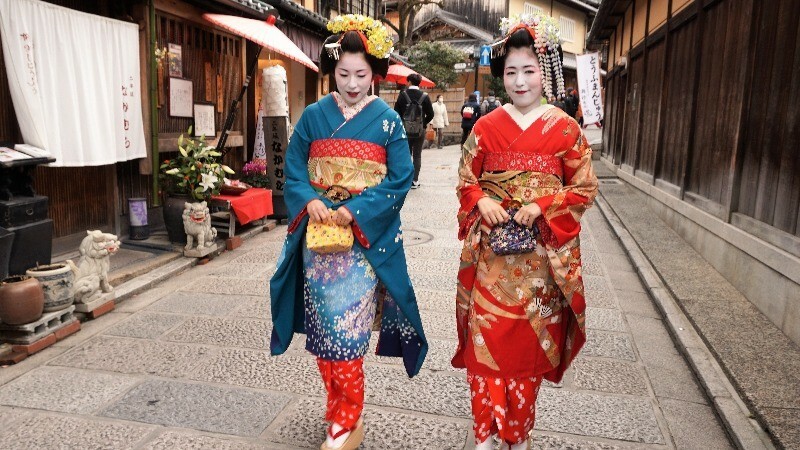 Good points: They have 10 shops in Kyoto and 10 different kimono plans for you to choose from! 3Shiki Sakura Shiki Sakura is a kimono rental shop close to Kiyomizu Temple and the area where you change into a kimono is not too small. The prices for kimono rental here start at around 4,000 yen, but they sometimes have offers starting from 2,980 yen too. Look at their official webpage for more information. This simple pink kimono looks very chic, and the red obi sash makes it look cute too. 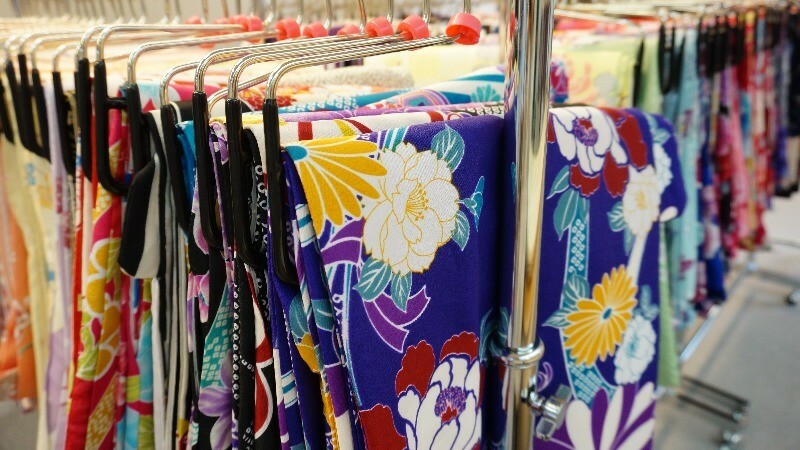 No matter whether you want to rent a chic kimono or a colorful one with vivid reds and purples, they have them here. Good points: They sometimes have offers for a limited time, so be sure to make a booking when they have a sale on! 4Okamoto Gion Okamoto is often mentioned in many blogs, as it offers a good selection of colorful kimonos, obi sashes, hair accessories, and bags. Okamoto has six shops around Gion, and they offer a traditional Japanese experience in the look of the shops too, so the atmosphere is very nice. I felt so active wearing this red kimono with a pretty floral pattern on it. Close to the shop, you can find many food stalls at Yasaka Shrine, so you can feel the festival atmosphere of Japanese matsuri events all through the year! Good points: You get to change into the kimono in a traditional Kyoto town house, so the atmosphere is very Kyoto-like. If you’re feeling like wearing a kimono is not Japanese enough for you, then you need to transform into a maiko at Maiko Transformation Studio Shiki. Everything feels very authentic, as they help you put on a wig and the maiko makeup, and when you look into the mirror, you no longer see yourself there, but a maiko! Once you also put on the geta-sandals, you’re ready to go outside and walk on the streets of Kiyomizu and take pictures. Walking as a maiko makes you feel like a movie star as everyone is taking photos! Don’t worry about removing the makeup, the staff at the shop will help you do it. 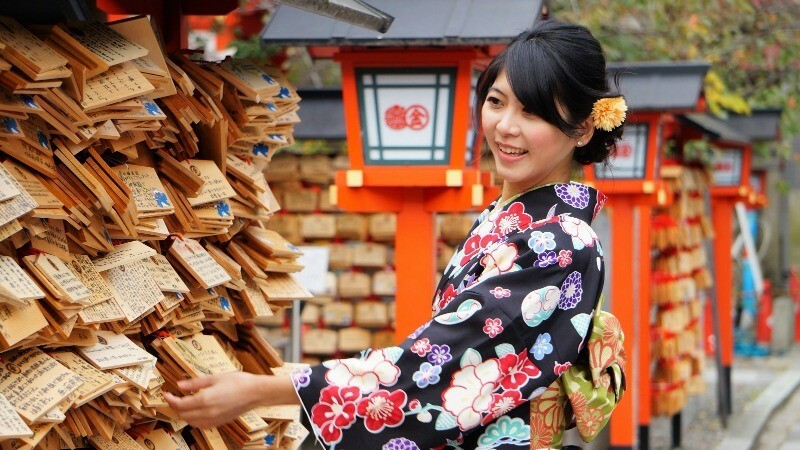 Good points: You get to become a maiko; a rare opportunity!